Sure, we’ve seen Lt. Nerd post his bloviating nonsense on Facebook, however, what you won’t see is Lt. Nerd, much less any official within the MI-GOP apparatchik call out The Nerd himself for his rather unseemly profitable actions. Think there isn’t big money in dead babies? Try $24,250 for a vial of 5 million cells. That is fact. 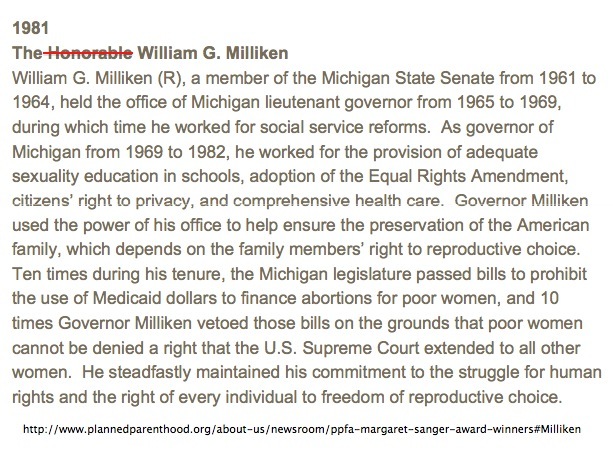 Now, do you want to know what else you won’t see the MI-GOP apparatchik do? You won’t see any within the Party give the Nerd’s mentor, this doddering old Leftist tool, a boot ride out of the Party. Folks, I’m beyond tired of the quislings in the “big tent”. It’s past time to start booting their treacherous asses out to where they belong. Apparently, those very ghoulish videos are hitting a little too close to the mark for them. No court would stop me from releasing such things anyhow. They would slip out..
Like CS pointed out below, it didn't take long. Still, I think that Kid Rock had the perfect response to yet another judge who hasn't read the US Constitution. That stupid injunction didn't slow them down, did it? If I remember correctly, it was Bill's wife Helen who pushed for women's rights and abortion. He did what she told him to do.